The books are all in fairly good condition with bindings, although ‘Book 1’ was used for handwriting practice by children, probably in the late 19th century. 2. 1776-1780 - GAP Some minute entries made for 1781, 1793, 1794 & ?1795? The books are in various states of preservation: some have no covers and broken bindings, while others are in good condition. Books include completed sections for residents, non-residents and adherents, all arranged alphabetically by name giving residence and some details of occupation. Dates and reasons for removal from the rolls (e.g. death, migration, lapse etc.) are often noted. Occasional notes regarding other personal facts e.g. marriages, first communion and originating parish in cases of settlement etc. are given variously. Poor condition, lacks rear board cover. 12 One of the original secession churches of the ‘four brethren’ – led by Erskine. James Fisher was the minister at Kinclaven Parish Church from 1725 and later became Erskine’s son-in-law. The building still stands in ruinous and dangerous condition. It is possibly the oldest surviving church built by the first secession. 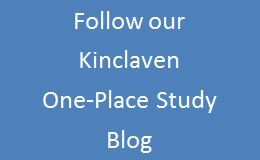 The two church congregations of Kinclaven were united in 1930 when the United Free Church re-joined the Established Church of Scotland.